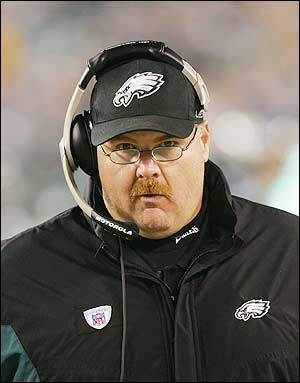 Now that head coach Andy Reid and the Philadelphia Eagles are watching the Super Bowl from their La-Z-Boys at home thanks to their first-round loss to the eventual NFC Champion Green Bay Packers, it’s time to engage in our annual rite of winter for the last 12 years—the “Why did this happen again?” ritual. The only problem is that it’s the equivalent of watching the myriad of Gilligan’s Island episodes where they get this close to getting off of the island only to be thwarted by some goofy event that keeps them there. To call the Eagles’ playoff futility during the Reid era a bad re-run is an understatement. As I walk around town, listen to all the noise on sports talk radio, and holla at all the bruhs at the pool hall, a lot of Birds fans are saying it’s time for Reid to go. On one hand, I would say they’re probably right because Reid, while he has been a successful NFL head coach, has not taken this team beyond just being a perennial playoff contender. When you’re a fan of a team that hasn’t won any manifestation of the NFL championship in 50 years, just making the playoffs is not enough. But for those of you who are looking to run Reid out of town on a rail, and I include in this group my girlfriend who believes he never should have been hired in the first place, forget about it. It ain’t gonna happen any time soon. Jeffrey Lurie and Joe Banner are satisfied with their ‘ol ball coach. That said, I think that one way for the Eagles to end their era of playoff frustration is for Reid to change his offensive philosophy. The Eagles pass-happy offense has scored them lots of points and won them lots of games over the years, but in the playoffs the lack of a running game has always come back to haunt them because you can’t be one dimensional and expect to win a championship. It’s easy to stop a team when you know what they’re going to do on every play. You would have thought the NFC Championship losses the team has suffered would have taught Reid that. Oddly enough in that game in which the Eagles lost 14-3, Eagles running back Duce Staley gained 79 yards on 13 carries, averaging 6.1 yards per while his backfield mate Correll Buckhalter had 11 carries for 48 yards, averaging four yards a pop. You can only wonder what would have happened if the Eagles really believed they could run and actually committed to it. Moving forward to next year, the Eagles do have needs on both sides of the football, most notably on the offensive line. But even if the Eagles shore up the offensive line, will we see a balanced attack on offense? We should, but with Reid’s stubbornness you probably won’t. All you need to do is look at what second-year running back LeSean McCoy managed to accomplish with a patchwork, often-times inconsistent offensive line. He averaged five yards per carry and gained over 1,000 yards. When he’s had the ball in his hands late the game, he has produced. What I like about “Shady” McCoy is that he wants the ball in his hands as a running back when the game is on the line. What’s even more amazing is that it’s not like it hasn’t been successful during the few times in which Reid has stuck with using the running game. That was the case in the Eagles playoff run in 2006 with Jeff Garcia quarterbacking the team when Donovan McNabb was out for the season. In 2008, after McNabb was benched in a loss to the Baltimore Ravens, the Eagles went 4-1 in the final five weeks of the season, made the playoffs and eventually went to the NFC title game when they decided to run the ball. What really gets me is that even teams with terrible running games throughout the playoffs at least tried to run the ball enough to maintain some balance. That was the case in the Packers’ win over the Eagles when rookie James Starks ran through the Eagles defense for 123 yards rushing. Through the playoffs, the Packers managed to keep teams from pinning their ears back and attacking Aaron Rogers by utilizing Starks. You can say all you want that Reid is not going to change his pass-happy style and you’re probably right. But if he doesn’t, we’ll be having the same conversation again for another few more years. And Birds fans will still be stuck on the lonely island of 1960. ABOVE PHOTO: Spike Lee speaks to guests and media about his project highlighting ads for the Martin Luther King Jr. Memorial. NEW YORK—While there are a great many things that you can say about the work of award-winning director Spike Lee, the most obvious is that it shows a personal reverence for African American history and culture. Whether he’s a shooting an epic film or a commercial selling sneakers, Lee refuses to engage in any project that would in any way demean the image of African-Americans. That was something he made clear during a dinner earlier this week announcing a series of television and print advertisements that he directed for his company Spike DDB highlighting Chevrolet’s support of the National Martin Luther King Monument in Washington, D.C. The commercials began airing nationally during MLK day weekend. During his presentation, Lee talked about the great migration of African Americans from the South in the early 20th Century to industrial centers like Detroit and how the automobile factories like General Motors gave jobs to African Americans. Lee’s reverence for history comes from his grandmother, who lived to be 100 and was the daughter of a slave. His grandmother’s mother got her college degree from Spelman College in Atlanta as did his grandmother and mother. “When you think about it, slavery was not that long ago. 1865 was four and five generations and so we’re not that far removed,” Lee said. 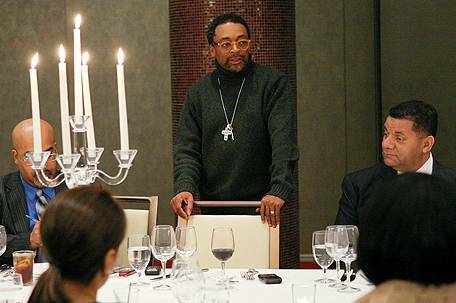 After the formal proceedings, Lee took some time just to kick it and talk about the current state of Black America. His biggest concern was over the high drop out rates of young Black males and the idea that it’s now cool not to be a good student among African American kids. When it comes to history, Lee is bothered by the lack of appreciation that young people, regardless of race, for those that came before them. While he understands it to be generational, Lee there are just some things folks ought to know. “You still knew who Jackie Robinson was, you still knew Harriet Tubman was because your parents told you,” Lee said smiling. Lee pointed out that the reverberation from the crack cocaine epidemic from the 1980s and 1990s devastated the family structure in the Black community. Additionally, he also pointed out that in the quest for integration, Black-owned business suffered as well. Even with all of his success as a filmmaker, Lee said that it’s still difficult to make films in this difficult economy that aren’t in the genre of 3-D, Sci-fi or the ones that exploit the various stereotypes of African American. He said his movie, Bamboozled, which was released back in 2000 foreshadowed what he feels is the current state of affairs in Black film. While every filmmaker has their own ideas on how to entertain and engage in story-telling, Lee is a firm believer that you can entertain audiences and have them walk out of the theater more informed than when they walked in. In terms of his film projects for 2011, Lee he has some plans in the works, but was mum on about the specifics of those projects.